StumbleUpon is website that helps you to â€œstumble uponâ€ articles, posts and photographs that match your interests. 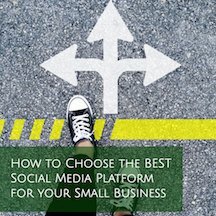 After reading the article presented to you, you can choose whether or not to “like” it. The more likes an article receives, the more times it will be presented to future stumblers, which in turn means more pageviews for that website owner. Many website owners and bloggers encourage the sharing of their articles to StumbleUpon in hopes of driving traffic to their sites. StumbleUpon can be a very powerful tool; when used correctly, some stumblers have garnered up to several thousand hits on a single post, in a single day. Before you can enjoy the additional traffic that StumbleUpon may bring, you first need to create an account and find other users to follow. Like with many other social media and social bookmarking sites, you are given the option to search among your current contacts. As you find and follow other users, be sure to check the box beneath the Follow button that reads, â€œAccept Shares from the Toolbarâ€. This extra action will come into play when sharing your own content with others. This is the toolbar that Google Chrome users see. 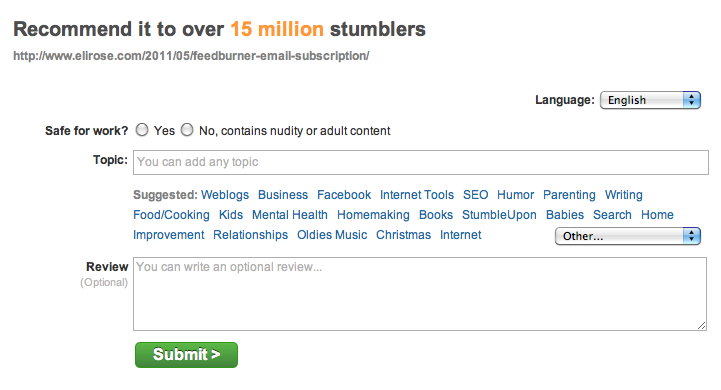 If you are using StumbleUpon to find new content to read, click the Stumble! buttonÂ at the far left. You’ll then be presented with a new article to check out. For those who use StumbleUpon as a potential traffic driver, you’ll mainly be focused on the Thumb Up (I like it!) and Share buttons on the toolbar. StumbleUpon’s Thumb Up button is similar to a Facebook Like. By clicking it, you are telling StumbleUpon that you give that post your vote. If the post you thumbed up has been liked before, the Thumb Up button will turn green and you’ll remain on that web page. But if you are the first person to thumb up a particular post, it is considered a â€œDiscoveryâ€ and you’ll be prompted to complete a review of that post. It is important for every thumbed up post to receive a review, and a review pop-up is only presented after a discovery. So be sure to take a few moments to mark the required fields and add tags for all posts that you discover. Once a post is discovered, it’s added to the extensive StumbleUpon database, giving it a chance at another user stumbling upon it. StumbleUpon wants its database of articles to be based on unbiased readers’ suggestions of enjoyable, worthwhile posts, so excessively thumbing up your own content is frowned upon. That’s not to say that you can never thumb up your own content. Many stumblers use the 10% approach, meaning that for every 10 articles they thumb up, only 1 is their own content. Also, you can use the toolbar’s Share function, which is a way to suggest your content to your followers in hopes they’ll read it, enjoy it and click the Thumb Up button. As you start thumbing up others’ content (and hopefully receiving some thumb ups of your own), you may want to check on how those articles have fared. From your Profile page, click on the Favorites tab to see the number of views, reviews, likes and tags of each article you’ve thumbed up. StumbleUpon is a very popular – and somewhat complex – social bookmarking site. While this post explains how to get started with this tool, upcoming posts will include topics like sending and accepting shares from others and how to add and change a review. 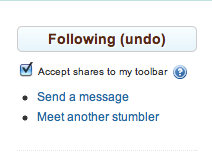 Are you using StumbleUpon?Â If so, come find LizJostes, TamingInsanity, MyTimeAsMom and AmandaEAustin. This is the 1st in a series of posts about how to useÂ StumbleUpon. Every time I read your posts, I think your information can’t get more valuable…and then it does. Thank you. That is a very kind thing to say â€“ Thank you! We are happy to be providing value to you with our posts. I sporadically use StumbleUpon, not having had time to maximize it functions, so thanks for this! That’s so great – thanks! Thanks for spreading the love, Kristi! A couple of weeks ago someone stumbled a post of mine from over a year ago. I can’t believe how much extra traffic that action is still generating to my site. However, there is a little bit of a downside I’m seeing from this activity. My bounce rate had increased significantly since my post was stumbled. I’m guessing that means I’m getting traffic to that post from folks who don’t typically read blogs and therefore don’t “stick around”. That is definitely true. The more you get your site “out there”, whether it be through SU or some other method, the higher your bounce rate will be. It’s just one of those trade-offs. I had no idea what SU was until this post. Thanks once again for all the wonderful info! This is great. It cleared up a couple of nagging questions. One more that occurred to me as I stumbled this post – I opened the post from my reader, so it used the feedburner URL. Do you happen to know if stumbling it that way is considered a different stumble than with the normal URL? That is a very, very good question. What’s your handle? There is an easy way to review what you Thumbed Up. Maybe check and see if the link takes you to the post page or Feedburner post URL? I’ll also look in mine as I, too, thumbed it up. I think it will say who of my friends also liked it. Mine is FarewellStrangr. When I did it, I actually stumbled it without the Feedburner post URL so can’t tell whether it was different or not. I signed up for SU a few days ago on @mytimeasmom’s advice, and hated it so much I deactivated my account after a couple of hours of trying to figure it out. You make it look so easy… I might have to go over there and sign back in. I absolutely love StumbleUpon! Not only is it a great boredom killer when you have a few minutes to kill, but it does do amazing things for your traffic. I don’t understand that bounce rate thing though?